To see like a city, rather than seeing like a state, is the key to understanding modern politics. 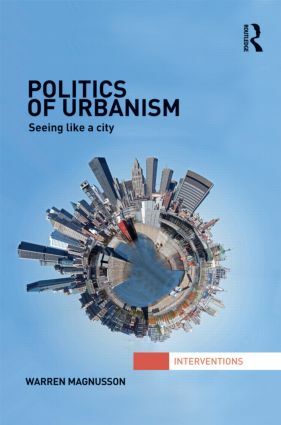 In this book, Magnusson draws from theorists such as Weber, Wirth, Hayek, Jacobs, Sennett, and Foucault to articulate some of the ideas that we need to make sense of the city as a form of political order. Locally and globally, the city exists by virtue of complicated patterns of government and self-government, prompted by proximate diversity. A multiplicity of authorities in different registers is typical. Sovereignty, although often claimed, is infinitely deferred. What emerges by virtue of self-organization is not susceptible to control by any central authority, and so we are impelled to engage politically in a world that does not match our expectations of sovereignty. How then are we are to engage realistically and creatively? We have to begin from where we are if we are to understand the possibilities. Building on traditions of political and urban theory in order to advance a new interpretation of the role of cities/urbanism in contemporary political life, this work will be of great interest to scholars of political theory and urban theory, international relations theory and international relations. The Series provides a forum for innovative and interdisciplinary work that engages with alternative critical, post-structural, feminist, postcolonial, psychoanalytic and cultural approaches to international relations and global politics. In our first 5 years we have published 60 volumes. We aim to advance understanding of the key areas in which scholars working within broad critical post-structural traditions have chosen to make their interventions, and to present innovative analyses of important topics. Titles in the series engage with critical thinkers in philosophy, sociology, politics and other disciplines and provide situated historical, empirical and textual studies in international politics.